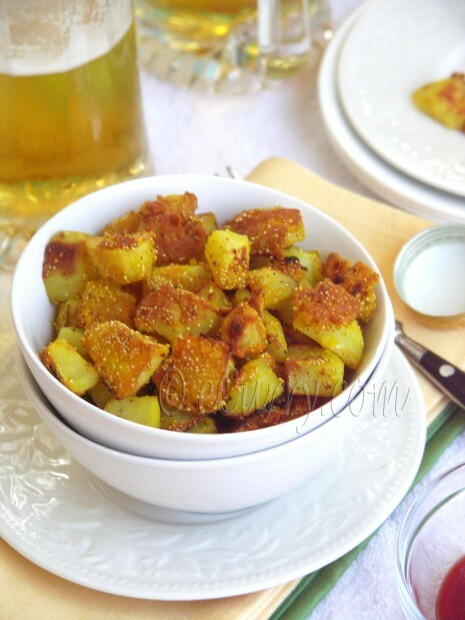 Loochi (deep fried puffed bread) Aloo Bhaja and Dal (soupy lentil) Aloo Bhaja are a quintessential Bengali dishes. While Aloo Bhaja simply means “fried potatoes”(Aloo=Potato, Bhaja=Fried), traditionally it holds a more deeper meaning – it is a big part of the cuisine and culture. 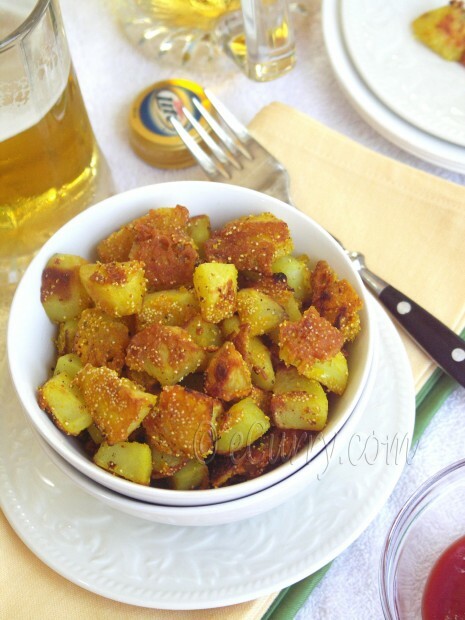 Paired with Loochi, the fried potatoes usually makes a luxurious weekend breakfast, or the two together often make their way to the lunch boxes, saved for special occasions and also to make something quick and delicious for guests . I have sweet memories of my ma serving coin sized Loochi with shoe string fried potatoes when I would invite an entire neighborhood of friends to celebrate my doll’s birthday or even for a doll wedding. Paired with rice and dal, it makes a more humble side dish. There are “aloo bhaja” which are twins of french fries or some which looks and tastes like the shoe strings; the others are cubed or sliced, coated or plain, stir fried or deep fried. But this one is a little different. The first time I had this was in a friend’s home and I got quite addicted to these; crusted and crispy on the outside and melt in the mouth inside, these can soon be your worst enemy for you would not be able to stop. I found more uses for these fries than just a side dish. A little spiced up, they make fantastic appetizers. Over the years I have found ways to cook them in a skillet rather than deep frying them and yet getting the same crispy outside – a small effort to make it a tiny bit healthy if that makes anyone feel better. Make sure you use a thick and heavy bottomed pan for this. Since this dish is supposed to be deep fried and I have pan fried them to get the same crispy texture, they need to cook well and not stick to the pan. I use my cast iron pan. Combine the chickpea flour, 2 tablespoons poppy seeds, turmeric, chili/cayenne powder and salt in a bowl and set aside. Optional step: If you think the kind of potatoes you are using will take too long to cook, plunge the diced potatoes in boiling water and cook only for a couple of minutes; drain and proceed with the coating and cooking them in skillet. Peel and cube the potatoes. Wash and drain them, but do not dry them off completely. (no additional water is used to the flour to make a batter; the flour will have to stick to the potatoes). Place the washed potatoes in a large bowl and add the above combination of the chickpea flour and the spices few spoons at at time to the cubed potatoes while tossing them so that the flour coats the cubed potatoes. 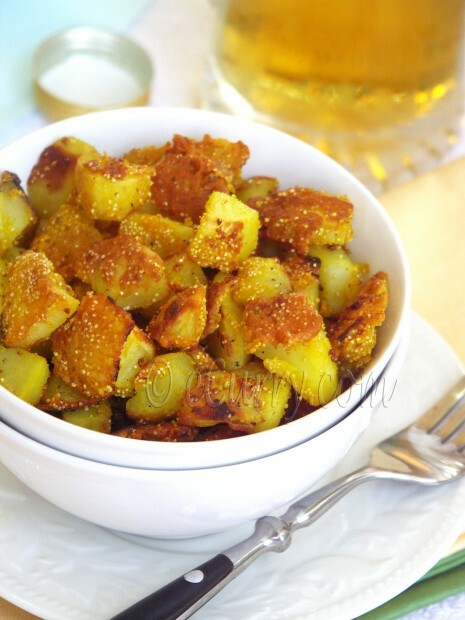 Sprinkle the 1 tablespoon of poppy seeds on the cubed potatoes and toss again. Heat oil in a thick bottomed skillet (cast iron works the best for me). Spoon over the flour coated potatoes in a single layer in the pan. Cook at medium heat till the potatoes are brown on the bottom side and can easily be flipped over. Do not forcefully flip them. When the flour is cooked and brown, they will easily come off the skillet. Cook all sides of the potatoes till they are brown and the potatoes are cooked through. Sprinkle some sea salt and freshly ground black pepper. Serve hot as a snack or side dish. Finally I made it to the ongoing Fall Fest; Root Veggies this time. The Versatile Blogger Award has been given to me by Sayantani and Pree. Thanks a lot. Here are a few things about me. What a fantastic dish this is and your photos are just as good! I MUST try these! Hows u ? This such a beautiful, simple recipe. I miss poppy seeds. They are banned here so cant use them. So my common substitution is nigella seeds. How interesting. I love it when I find something completely different. I’ve got some gram flour in the cupboard and poppy seeds. Bookmarked for the weekend. Gorgeous recipe Soma. You don’t boil or parboil them first do you? I love using poppy seeds in food especially kebabs. These taters look fab! I never know what to do with potatoes when I make an Indian meat meal and this is perfect! The crunchiness will make everyone happy! I love the cast iron idea to get these crisp. Defenitely trying this. I do a sesame crusted potato in the oven. Hi Soma, I make this dish in a slightly different way. I boil the potataoes, leave them in the fridge overnight and then the next day I cut them into cubes along with the skin. Then I cook them in the skillet with salt, pepper and poppy seeds. They brown and become crispy in just a couple of minutes. I will try out your version this time. The photos are beautiful. I like your idea. Do you use the besan too? or do you do it with just poppy seeds? Those potatoes look delicious.. Addition of besan and poppy seeds sounds yummy. Wow, three of my favorite ingredients in one dish! Those potatoes look irresistible. Excellent Recipe Soma. Loved the very look of it. Must have tasted superb. Potatoes look super yummy. I make a similar dish but w/o poppy seeds. Will try this version next time. Love the poppy seeds. Yes – I have seen Ilva’s link on Facebook and I am going to make these with the chickpea flour I have to use up soon! Usually I do with only poppy seeds. Sometimes I add a little besan or brown rice flour. Love the pictures as usual!! !Delicious side dish! Absolutely delicious and the poppy seeds is a nice touch. I use powdered dahlia instead of besan for taro and raw banana fries. I must try them with potatoes. Irresistible potatoes, feel like finishing that whole bowl..
Soma,Happy Diwali to U & your family. I must admit I would be like you, eating and eating this and not able to stop! the potatoes look so good and I was not aware of the existence of white poppy seeds! I love poppy seeds and can just imagine the awesome crunch they’d give to this potato dish. Thanks for sharing this great recipe :). The crust is awesome! And I bet the fried potatoes are delicious. Very interesting! Love the crunchy crust! I can imagine how delicious the potatoes taste with the poppy seeds & Chickepea flour crust! Great Recipe! You will feel the little pops of poppy seeds crunch in the bites of the fries. The white poppy seed also has a very mild unique flavor, which we love this in the dish! Hey Soma, I have tried this recipe of your’s and the potatoes tasted delicious. Thank you!